While doing press for this weekend's action-thriller Sabotage, Arnold Schwarzenegger offered new details about Terminator: Genesis in an interview with MTV, revealing that there will be a younger T-800 model, and that these Terminators actually "age" in this franchise. Arnold Schwarzenegger is returning as the T-800 in a sequel that is being described as a reboot, despite being 66-years-old. How is this possible? 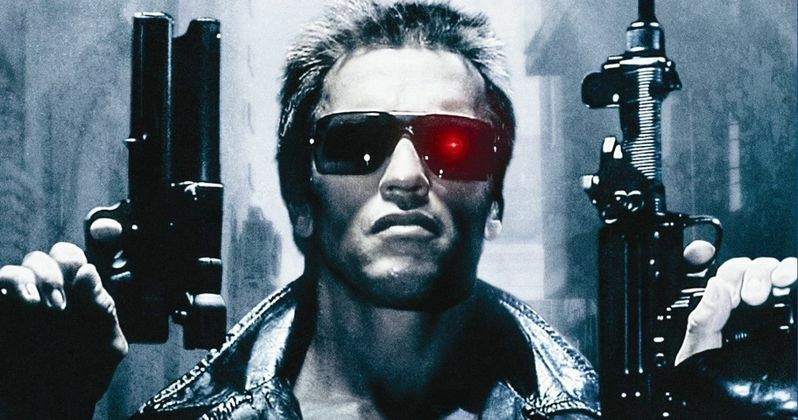 Since the actor was in his 30s at the time of the original and its sequel, the action icon explains that the skin of the cyborg ages just like a human being. "Terminator deals a lot with time travel, so there will be a younger T-800, and then what that model does later on when it gets reprogrammed, and who gets a hold of him. So it will be all kinds of interesting twists in the movie, but I feel so good. The way that the character is written, it's a machine underneath. It's this metal skeleton. But above that is human flesh. And the Terminator's flesh ages, just like any other human being's flesh. Maybe not as fast. But it definitely ages." Production will begin at the end of April, under the direction of Alan Taylor (Thor: The Dark World). Earlier this month, the actor revealed how action-packed this sequel is, comparing it to Terminator 2: Judgment Day. When asked about how challenging it is to step back into this franchise at the age of 66, he had this to say. "We start at the end of April. It will be challenging because it will be a new director, and it will be a really action packed movie. And sometimes it does get more difficult when you're 66 years old and doing this kind of action, versus when you're in your 30s or in your 40s." He also commented on 2009's Terminator Salvation, the only movie in the franchise that was made without him, since it was during his term as the Governor of California. "I was upset that I couldn't be in the fourth Terminator, because I was Governor. So they did the fourth one without me, it made me cry a little bit. But I did say, 'I'll be back,' so now I'm back again and it's going to be really terrific." Terminator: Genesis also stars Jason Clarke as John Connor, Emilia Clarke as Sarah Connor, Jai Courtney as Kyle Reese and J.K. Simmons as a detective who has been following the original Terminator case for 30 years. We reported last week that J.K. Simmons is rumored to play Detective Vukovich, originally portrayed by Lance Henriksen in The Terminator, but that has not been confirmed. It will be interesting to find out why the 'old' T-800 was sent back to when Sarah was younger, while the 'young' T-800 found itself in 1984. It sounds like there will definitely be some plot twists in the story.